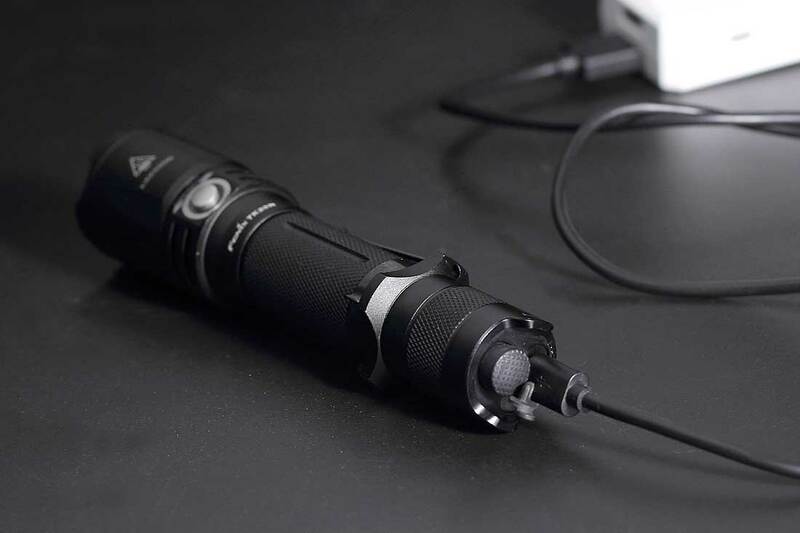 The Fenix TK20R micro-USB rechargeable flashlight delivers a maximum beam distance of over 1000 feet (310m) by utilizing the CREE XPL HI V3 LED with a maximum output of 1000 lumens. Powered by a rechargeable 18650 battery, this flashlight can also use two cold-resistant CR123As as standby batteries. Features include a dual layer body, inner waterproofing treatment, a tactical tail switch along with a side switch, and battery power indicator. This compact flashlight is designed for tactical and industrial applications. *Due to the intelligent overheat protection, the runtime of Turbo is estimated. This is my third Fenix light. They’ve all been great lights. This one is my favorite so far. 100% Love this light. Holds a charge forever seems like. Only have to charge it once a week or so. It’s not a duty light for me, but I imagine if I needed one, this would be it. I work in security this is by far the best flashlight out! That should not be happening. I will have warranty contact you. 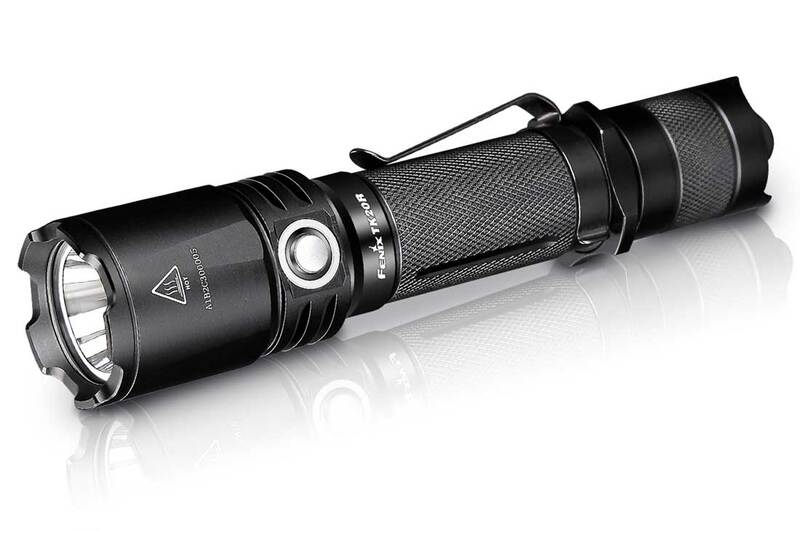 This flashlight is durable, water resistant and tough as nails. Not to mention it is tremendously powerful for his size. A great product. I work high end security and have tried multiple flashlights, and the TK20R has out performed them all. I highly recommended this model to anyone looking for a superior product at a reasonable cost. This light is the best flashlight of this size that I have ever used. As a Papermaker, the conditions that this light is used can be treacherous at times. Thanks for a good, quality product. I will be buying more in the future. I like the light just wish the head of it was a little smaller in diameter. I use the flashlight a couple of times the throw is good and the quality is good but I did find some metal shavings when I unscrewed the endcap cap to put in the battery. Which I found a bit disconcerting but the overall quality is worth $100 even though it is made in China which is fine because you guys don’t charge the exorbitant prices as if it was made in the US like Levi jeans charging the same price as if it was made here but made over there, wherever there is. The brightness is okay though your commercials are a hair bit misleading because you use them in total darkness which in reality eg. the city, the only real effective settings are the 350 lumens and the 1000 lumens. Which are are excellent, I am satisfied very much so with your product. Thank you sincerely William L Mitchell. Very good quality, I will be purchasing another one soon. Great light what more can I say. This is my second one. Very powerful light, very great buy. Very well crafted with excellent light output. Favoring on the large size for shirt pocket, but workable if you need a bright hardy light. This is my second TK20R light and my #6 Fenix product. I love the TK20R!!!! I use one as my EDC and the other on my Department issued AR. Both are super bright and the bright clear color rocks. That being said, I am also looking for a 2000 lumen light this same size, I hope Fenix produces one soon! Rock on guys and keep producing awesome products!! Amazing lite! I noticed that J. Alain Smith uses one. Have you ever thought of sponsoring his show rugged expedition??!! Great show and great product! Great flashlight for the price! I use this one when I’m at work on an oil rig. It’s small enough to keep in my pocket to carry for 12 hours comfortably, and also bright enough for whatever I need it for. I didnt have to charge it for 3 days and I used it quite a bit. I also recommend buying an extra battery to swap out with. Awesome light works very good finding my deer stand in the pitch black. Very well made it has a long lasting battery. I work in a foundry and this light is perfect for what I needed. In the last 15 years I have had several flashlights most of them where junk the Fenix TK20R USB Rechargeable Flashlight is the best flashlight I have ever used. I have a 107 pound German Shepherd and he smells the vagrants before I get to them and the Fenix TK20R USB Rechargeable Flashlight is so bright that I can see them when he alerts of their presents. Nice tactical light. The back button is easy to find and press. The back button and handle is good for using with pistol. The light beam is wide and the center beam is a perfect circle. Its super bright on high! Nice knurled head on it too in case you need it for a weapon. My favorite overall of 5 different fenix lights I own. The only improvement is making the side button easier to locate by feel. Charging it is simple and convenient! This is the absolute perfect tactical light for my needs. Previously had a budget tactical light, which has been good so far, but no where near the durability and function of the Fenix. Love the fact that it operates on the 18650 battery, and even has an external charging port and the switch charging status light lets you know if it needs a charge before going into the field, no guessing. The size is a perfect fit for gripability and carry. Crown design allows it to be stood up and still generate useable light on a table. That and the base hex nut makes this a no roll light. i’ve been using this light for the last month. So far it is the best light I’ve owned. I like the variety of settings, great for all situations. The light recharges quickly. I am happy to have it on patrol with me. Great light…delivered on time…I hope that if we do have any problems….the service would be great. I bought two of these. One for my wife and one for me. We keep them in our cars when we drive at night. We use them when we walk our dog at night. The best feature is that from any of the four power settings (Low, Mid, High, Turbo), one momentary push of the mode button activates the strobe at Turbo power. The ease of quicky activating the strobe was essential for me. The TK20R flashlight mets this requirement very well. A little overpriced; otherwise an excellent product. This TkR20 light is a very well made HD light , very bright and durable , it’s portable but packs a punch when you need it . If your looking for a true professional quality light look no further. This is the brightest small flashlight on the planet. Ideal for finding the dog in the dark yard at night. Easy to charge. Nice to be able to pop in regular batteries if need be. Bought two, one for daily use, one for the emergency kit. It’s a bit heavy, so not my choice for backpacking. Love the rechargeable, and it’s very bright and compact. Best flashlight I ever used . Excellent perfect size carry light. Bright and light weight. Great flashlight. Fits my hand just right. I think this might be the perfect all-around flashlight. Not too big and heavy to carry and use almost anywhere, but large enough and sturdy enough to have some serious brightness horsepower and ruggedness. Best flashlight I’ve ever owned; seconded to none!! My newest Fenix Flaslight. I own 3, Tk20r, PD35, & an E12 that I carry all the time (my EDC). I have also gifted Fenix Flashlights, 12 so far. This TK20R is basically a PD35 that is Made Even Tougher with the added Feature of a USB port for charging simplicity. TK20R also has an integrated battery status built into the side switch. At 1000 Lumens and a long throw it is a great camping flashlight & security light for looking for Eyes of a predator looking for a Meal. I live in Mountain Lion country & Bears visit occasionally looking for scraps mistaking put into my garbage. I highly recommend the TK20R!! Next Fenix – The LD15R! Then, a TK75 award winning Flashlight. Great Flashlights & many to choose from to suit most any need!! Nice and bright and light weight. Easy to use with a push of a button you can easily go through all the settings. Fenix lights are definitely worth the money. I have tried other brands that are lot more expensive. Fenix lights are affordable yet delivers what it states. I love TK20R for its size and brightness. I’ve had my light for about 6 months and it has worked great. Only issue is now when using my rechargeable battery the indicator light will turn to orange and my tail switch and side switch traded functions. This is a problem because the side switch gets depressed in my pocket and the light runs dead quickly. Please help. I put regular batteries in place of my 2900 battery and it works fine. Do I need a new battery? Or did a function get messed up? Wow For starters this light is very tuff and bright as hell upgrading from an old 80 lumen light to this beast is very nice light is everything as expected bright far range throw and can handle being thrown around from time to time. if your planing on buying a light from fenix buy this one best for price and brightness and throw/range for the beam. This is a positive and negative review for this light. I bought it after considerable discussion with a helpful rep from Fenix directly. My concern was that, as I was going to use it for sailing, that the seal that covered the USB port in the back of the unit was indeed watertight. I am a blue water sailor, and hard use and resistance to salt water is imperative. I was assured that it was indeed fit my criteria. Also, I was concerned that the original 950 lumens (50 lower than the PD35) would be noticeable. I was assured that in “real life” it would not be evident. I notice that the new ads for this unit say that it is 1000 lumens rated. Not sure whether there was a change in the bulb or design, but at least the “original” unit certainly seems “daylight” to me. All positives! Now for the negative. I sailed from Hawaii to Anacortes recently, and had some blowy days and nights sailing. My light failed after a day or so – it would not go on in any mode – I did find out that by unscrewing the base section, it would go on in one mode, but that opened it up to additional damage. What caused the failure? The rubber flap that seals the USB port came out and salt water spray got in – and as those that deal with salt water know, salt water and electronics do not agree. The seal is just NOT a good design. Pulling it out and pushing it in the storm pockets in my foul weather gear at night must have been the action/s that caused the failure. Astonishing bad design, in fact. It slightly protrudes over the edge of the barrel and so can get pushed out of its sealed position easily. I believe that is what happened in my case. Secondly, the base of the rubber piece that goes into the aluminum base is not robust. It has one rib in the rubber – the rubber insert part should have at least three so that the ribs can be forced down into the cavity and really have to be pulled to get it out. So: 1) tab used to pull open rubber protective flap bad design; 2) and ribs on seal itself inadequate. When I saw the light, I thought that this might be a problem, but hoped for the best – I had no time to return it, so took a chance. Fortunately I had a dive light on the boat and so used that. While I was out of warranty, the gentleman who answered the call did replace the unit with a TK15 unit that hopefully will do a better job. Not quite what I wanted, but OK. Good for customer service to step up though. So… I’m not sure if Fenix will publish this review, as it is negative and points out a failure with their design (for rugged and/or water use). We will see. Top performance whenever needed. Good hand ‘fit’, my first choice in lights everyday, PERIOD. Love my TK20R. It is my first tactical light and so far I’ve had it for six months and I have exactly 0 complaints. I carry it in the included nylon holster on the side of my backpack and I use it almost everyday. Great battery life and design. Got this to replace my TK22 after it was lost. I love this light every bit as much. Despite the smaller head diameter I was still very impressed with the beam width. Walking down the street or in a hallway, it provides an amazing periphery to see. The central beam has even better throw than my TK22, I can see clearly much further. Both are amazing flashlights but I really like the USB charging, though rarely used since I have a battery charger for 18650’s but in a pinch or traveling it’s a huge help. After buying my first Fenix light, I’ve been so impressed I’ve continued to come back. My TK20 has shown to be no different. My tk20r just arrived today, free shipping, two days. AWESOME! It’s everything that is advertised. This flashlight is everything you need in a compact tactical flashlight. I’ll be using it for hunting and every day use. Can’t wait to show it off to my hunting buddies.